REDF, a San Francisco-based social-enterprise accelerator, prides itself on assisting its nonprofit partners in the creation of over 9,000 jobs for those with barriers to employment. REDF offers technical assistance to social enterprise leaders in business planning and co-develops strategies for creating inviting, supportive environments with wrap-around services to ensure that the employees of these double-bottom-line social enterprises have the tools they need to succeed in their workplaces. By offering both capital and business strategy assistance to California nonprofits, REDF supports the growth of social enterprises that employ the most marginalized in the labor force—those with backgrounds of homelessness, incarceration, addiction, or mental illness. To date, REDF has assisted 60 social enterprises. In 2011, REDF was honored with the prestigious Social Innovation Fund grant from the federal government, which has enabled REDF to expand its work to Southern California. Started by private equity executive George R. Roberts, the Roberts’ family foundation first involved itself in homeless support through its Homeless Economic Development Fund (HEDF) from 1990 to 1996. After analyzing its successes, the foundation determined that employment was the most promising vehicle for addressing homelessness. In 1997, The Roberts Enterprise Development Fund (REDF) was formed as a result. The social enterprises in all cases are affiliated with a nonprofit that has existed for some time. Either the nonprofit has had a social enterprise which it seeks to grow and scale up, or at the outset it partners with REDF at a start-up phase. 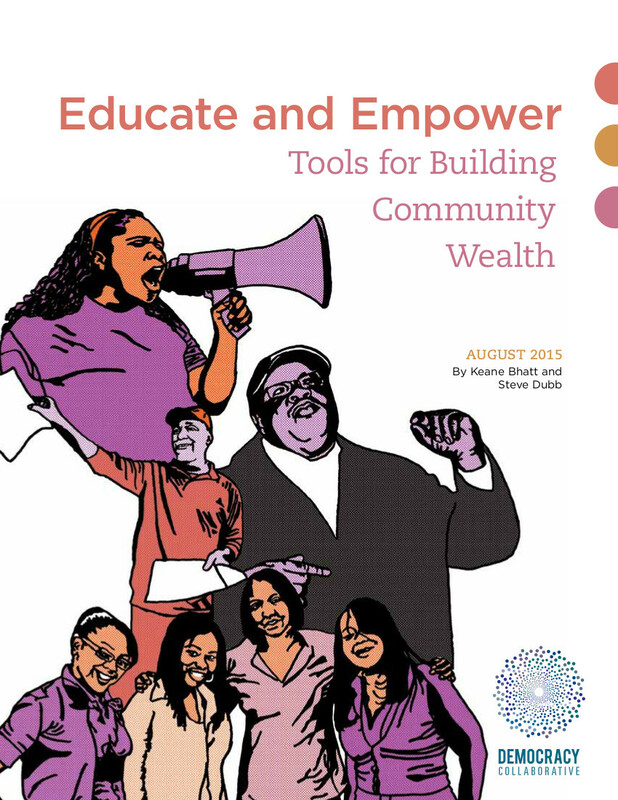 Learn more about REDF and other innovative community wealth building initiatives in our report Educate and Empower: Tools for Building Community Wealth. Foundations can assist community groups with both financial and technical support: Earlier in its history, REDF, like many foundations, provided financial support and was not deeply involved in employee-support issues. "We're still not particularly prescriptive on employment issues," says REDF associate Terri Feeley, "but we're now more proactive in asking questions and working with organizations to troubleshoot around employee-support issues." REDF has created a new stream for "barrier-mitigation funds" – flexible resources in order to help individual employees overcome barriers to work: money available in case she needs eyeglasses, a driver's license, or encounters an emergency, or needs support in paying for the fees to obtain a GED. Earlier in its history, "that sort of thing wouldn't have been within a REDF-supported budget," says Feeley. Codify and make accessible a range of services and insights to community development groups: REDF has an entire "catalog" of technical assistance work which is well-documented, says Terri Feeley. "We don't have to start from scratch. We can tap into what was previously created." REDF is working on a Learning and Impact Team, which is focused on codifying and providing a comprehensive list of findings to social enterprises internal to REDF's portfolio. The eventual aim is to make this available "to the broader community of current and potential social enterprise practitioners and funders." Regularly collaborate with grantee to chart out big-picture directions: While community organizations and nonprofits often have boards of directors ostensibly tasked with providing regular input on vision and long-term progress, in practice the internal evaluation process is not taken advantage of. "Having run a nonprofit," says Feeley, "So often you're mired in the weeds of getting the work done in a resource-constrained environment. It's a luxury to have a meeting once a month where for one-and-a-half hours a group of smart folks who know your organization inside and out, who share the same goals with you, are asking, 'What's working, what's not working?' Asking hard questions and chewing on them together and analyzing that, for me, is what distinguishes REDF from other groups. The nature of its engagement is a value-add that you can't put a dollar-point on." To scale up, develop a broad, hospitable ecosystem for grantees:REDF President Carla Javits argues that the "right enabling environment to get this flywheel of social enterprise turning at a higher level" is essential. The four elements of business, government, nonprofits and philanthropy "need to line up" and their interactions must be coordinated to grow the social enterprise sector. In Southern California, REDF has been intentional about creating social enterprises connected to the supply chains of various businesses. As those firms continue to procure from social enterprises, greater hiring opportunities emerge for low-income social-enterprise employees to become integrated into the workforce of those very businesses. Coordination with government further facilitates the social support for the employees that is essential for their successful employment and skill building. Apply business-like rigor to evaluate and improve performance: One of REDF's primary strengths is offering social enterprises global analysis by experienced professionals within the business community. "I could see how the power and proven practices of the business world could be applied to this problem [of joblessness] to bring real solutions," George R. Roberts said. He argues that applying the mindset of an investor to the operations of social enterprises with the expected return--"measured in people with jobs and lives changed"--strengthens their mission and outcomes. Complement skills-building with integrated support structures within human resources: While REDF has not fully integrated financial capability-building into all its social enterprise partners' operations, it has worked with one of its partners, the Community Housing Partnership (CHP) in San Francisco, to combine financial literacy with automatic participation in non-predatory financial services. CHP uses 100 percent direct deposits for its payroll, and makes signing up for a direct deposit bank account a part of the on-boarding process, and offers a responsible a debit card product with an account number that gets generated in five minutes of accepting a job.